A newborn baby is a child from birth up to 3-4 weeks of life. Body length of healthy full-term baby at birth equal to the average 48-52 cm (45 to 56 cm). The weight of his body on the average of 3,200-3,300 g (from 2500 up to 6000 g). Body length is more constant and rather reflects the degree of development of the newborn. Morphological and functional characteristics of goosenest newborn: a loud cry, pink skin color, satisfactory tone muscles, active movement, well expressed sucking reflex, regular breathing and loud heart sounds, rhythmic pulse, head circumference 1-2 cm longer than the circumference of the chest bone of the skull tight, opened the big and some small streams, the hair on the head with a length of 2-3 cm, nails protruding beyond the edge fingers, boys testicles down into the scrotum, girls labia lips covered large. To determine goosenest newborn should be considered, and the duration of pregnancy. From the moment of birth (neonatal period) the development of the functions of all organs and systems, adaptation of the newborn to independent extrauterine life. In this period, a regular breathing, is a reorganization of the blood, umbilical wound healing, a gradual increase in activity and consumption of breast milk, the adaptation of the skin to the external environment, the formation of thermoregulation , etc. The newborn there are the so-called special status. These include the onset swelling, physiological Qatar skin, physiological jaundice, physiological weight loss, hormonal sexual stroke, transient fever. The onset swelling appears on predlagay part of the fetus during labor in the serous soaking soft tissues, as a result of lymph and blood with the formation of small hemorrhages. More generic the tumor is in the area of the crown and nape (see Cephalhematoma); it may be on the face, buttocks, legs and genitalia. Usually in the next 2-3 days, the onset swelling disappears and special remedial measures are not required. When generic large tumor shown cold (an ice pack on the distance of 20 cm from the head of a child) in the first 2 hours and protivogemorroidalnoe treatment: inside 5% solution of chloride calcium 5 ml 4 times a day, rutin 0.02 g and menadione 0,002 g 2 times a day for three days. Physiological Qatar skin characterized by redness of the skin (erythema) as a result of the transition of the fetus in dry-air environment. Erythema gradually disappears to 5-7-th day life, and then in some children there comes a strong exfoliation of epidermis. In addition, 30-50% of newborns on 2-7 day life appears polymorphic rash consisting of small reddish spots and vesicles, localized on the body except for the palms and soles. This so-called toxic erythema. Disappears it in 2-3 days. Special treatment is not required. Physiologic jaundice is characterized by a yellowish staining of the skin and visible mucous membranes and eyes. It appears in 40-60% of newborns for 2-3 days, and rarely on 5-6-th day life and disappears usually 7-10-th day. The origin of physiological jaundice explain the increased destruction of red blood cells and functional immaturity of the liver newborn. Physiologic jaundice is no specific treatment is not required. Newborn give water to drink in 5% glucose or sugar (100 ml per day), isotonic solution of sodium chloride (100 ml per day) and vitamin C (100 mg daily). Rapidly developing jaundice in the first day of a child's life suggests hemolytic disease of the newborn (see). Jaundice in newborns can be a symptom of various diseases (see Jaundice). Physiological weight loss newborn noted in the first 3-4 days of life (sometimes up to 6-day) and usually does not exceed 8-10% of birth weight. Weight loss over a longer time or exceed 8-10% points to problems in the child's state of health or hypogalactia the mother (see Lactation). Hormonal sexual crisis is observed in newborns due to a shift of oestrogen hormones mother to the fetus through the placenta and breast milk. Occur in 0.7% of cases and is expressed in girls with bloating mammary glands combined with swelling of labia majora and sometimes bloody-mucous discharge from the genital slit, boys - the swelling of the scrotum. He appears on 2-5th day of life, a maximum increase of mammary glands is on the 8 - 10th day and disappears in 2-3 weeks of life. Breast enlargement does not require treatment. However, restlessness skin over the gland is possible to grease 2% iodine tincture or camphor oil, and put a light bandage from wool to reduce friction clothes. In this period in cases of breast cancer can develop its inflammation (mastitis), often followed by suppuration. Clinical symptoms of mastitis: hyperemia skin of the breast, the increased size of the glands, increased body temperature, pain and swollen axillary lymph nodes and the gland itself. Initially, the treatment can be conservative: ointment dressing, dry heat, UHF, antibiotics. In those cases, when there is a plot of softening, produce radial slit length 1-1,5 cm above the plot softening. The wound heals, 7-8th day. Transient fever occurs in 0.5 to 17% of cases and is manifested by a sudden increase in body temperature up to 38-40°not related to overheating or disease of the newborn. There it is on the 3-4th day life and often lasts several hours. Usually the temperature increase coincides with the moment of the greatest physiological weight loss newborn. With proper feeding and sufficient fluids fever is rare. Transient fever is sometimes difficult to distinguish from fever with any disease, if it continues for more than 1-2 days or occurs again. Transient fever is not significantly affect the overall condition of the newborn and does not require medical treatment. Should such a newborn more to give to drink boiled water, tea, 5% glucose solution, izotoniceski solution of sodium chloride based 80-100 ml per 1 kg of weight per day, to provide proper care, to eliminate the possibility of overheating, to provide the child with necessary quantity of breast milk. Fig. 1 and 2. Schema changes circulation occurring at birth. Fig. 1. The scheme of circulation of a fetus. Fig. 2. The scheme of circulation of the newborn. 1 - AA. carotides communes; 2 - vv. jugulares int. ; 3 - v. brachiocephalica sin. ; 4 - arcus aortae; 5 - ductus arteriosus; 5' - lig. arteriosum; 6 - truncus pulinonalis; 7 - atrium sin. ; 8 - arteries and veins of the upper limb; 9 - ventriculus sin. ; 10 - pulmo sin. ; 11 - aorta abdominalis; 12 - lien; 13 - ren sin. ; 14 - v. cava inf. ; 15 - r. iliaca communis sin. ; 16 - v. iliaca communis sin. ; 17 - a. iliaca int. 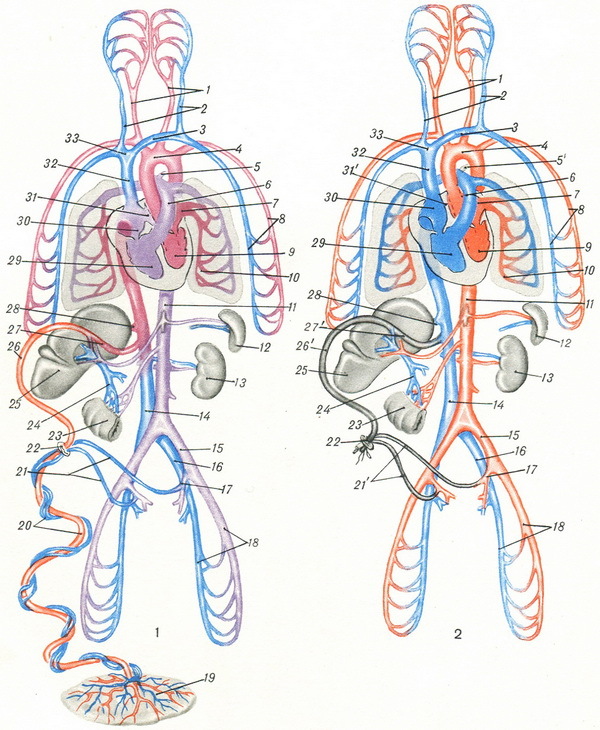 ; 18 - the arteries and veins of the lower limbs; 19 - placenta; 20 vessels of the umbilical cord; 21 - aa. umbilicales; 21' - liggurabilicalia lat. ; 22 - anulus umbilicalis; 23 - the gastrointestinal tract and its vessels; 24-v. portae; 25 - hepar; 26-v. umbilicalis; 26 - lig. teres hepatis; 27 - ductus venosus; 27' - lig. venosum; 28 - v. hepatica; 29 - ventriculus dext. ; 30 - atrium dext. ; 31 - foramen ovale; 31' - fossa ovalis (septum interatriale); 32-v. cava sup. ; 33-v. brachiocephalica dext.